The Samsung ML-2151N network-ready monochrome laser printer is built to meet the demands of busy workgroup environments. At print speeds up to 21ppm and 1200x1200 dpi print quality, the ML-2151N is equipped to produce professional quality documents quickly and effortlessly. To accommodate the busy office environment, Samsung offers the industry’s highest standard paper input capacity at 600 sheets with optional 500-sheet second paper cassette. The ML-2151N supports wide range of paper sizes from 3”x5”index cards to legal size paper at 8.5”x14”. 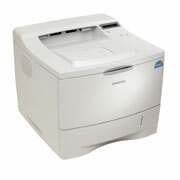 The ML-2151N is equipped with cost saving features that are also easy to use. One-touch buttons activate the auto-duplexing and Toner Save modes to reduce the total cost of ownership. Print on both sides of the paper and extend the toner capacity up to 40% by using the Toner Save mode consistently. The ML-2151N is highly compatible with multiple standard interfaces such as Hi-Speed USB 2.0, IEEE 1284 and 10/100 Base-Tx. It supports Windows (95, 98, Me, NT 4.0, 2000, XP), Mac (versions 8.6 – 10.2) and Linux (Red Hat, Caldera, Debian, Mandrake, Slackware, Turbo Linux, SuSe) operating systems. Other impressive features include 166MHz processor, 16MB memory (upgradeable up to 144MB), PostScript 3, PCL 6 & GDI emulations. Linux Red Hat, Caldera, Debian, Mandrake, Slackware, TurboLinux, SuSE.